With the Northern Lights in hiding we’ve turned to other activities – yesterday’s adventures included a trip down memory lane involving a visit to the Knotty Shop, a stop in North Pole to send mail and giggle about the postmark, and a visit to the Chena Lakes Recreation area where we roamed over the frozen lake. The lake’s ice was thick enough to not only support a small army of ice fishing huts, but also apparently strong enough to support the pickup trucks that drove across the lake and parked next to the huts. In a bizarre twist, today Fairbanks is experiencing highly unusual temperatures that are nearly up to 30°F, while San Antonio and much of the Southern United States is getting a rare ice storm. Ironically the host at our B&B told us that while Fairbanks never shuts down due to cold, the warmer temperatures bring ice (we’ve got freezing rain here tonight), and thus when it gets warm in the winter they usually end up cancelling school because things melt and then re-freeze, making the roads treacherous. Given the lack of Auroras I don’t have any exciting photos from the past few days, so here a couple more from four nights ago during the Big Show. This photo was taken around 10PM and captures the stars and the glow of the Fairbanks city lights against the clouds. Fifteen second exposure using a 10mm lens. We didn’t know in advance that the entire sky was going to light up, so I naively thought that this picture, taken around midnight, would end up as my favorite photo of the evening. Fifteen second exposure using a 10mm lens. The space weather forecast for last night was calling for the most active light display thus far, but the meteorological forecast was calling for cloudy skies, so our hopes were low. Ironically we ended up with relatively clear skies but little in the way of Aurora activity – our current lodge doesn’t offer the easy Aurora viewing of our last place, but despite waking up frequently and looking out of the windows it seemed to be a quiet evening in the heavens. Today Fairbanks enjoyed a heat wave, with downright balmy temperatures reaching all the way up into the twenties, so we’re able to be outside at length without fear of dying. We took advantage of the tropical weather by spending the day up at Chena Hot Springs, which was a really neat and at the same time very hokey place to visit – they had an amazing Ice Museum, it was ridiculously relaxing to soak in the hot springs under the dark skies while surrounded by snow drifts, and the restaurant was surprisingly good, but at the same time it very much had the feel of a place where tour buses drop off a load of people to be led around from activity to activity. Despite the touristy feel it was a great place to spend an afternoon, and the Ice Museum in particular was a neat find. It was clearly a kitschy thing to have an appletini at their “ice bar”, but who could pass up a cocktail served in a handmade, single-use cocktail glass made out of ice, while sitting at a bar that is also made from solid ice? We were even reluctant to part with our cup, and only did so once our fingers got cold from carrying it and we finally admitted that a glass made of ice was probably not something we could bring home in our carry-on baggage. Tonight, given the forecast of snow the odds of seeing the Northern Lights are low. Tomorrow I’ve got a day free of work due to the MLK holiday, so depending on weather we’re thinking of making a trip to North Pole, Alaska, which ironically is located a few miles south of Fairbanks. The Aurora Ice Bar in the Ice Museum, home of very manly appletinis. With the exception of the mirror and a small number of other items, everything in this photo is made out of ice. Details in the Ice Museum – these ice globes each had a different design embedded inside of it, and formed a ring around an altar that they use when people want to get married amidst the ice art. We had an inkling that last night might be good for the Aurora based on the space weather forecast, and after enjoying a couple of hours of nice displays, something suddenly changed and in a matter of minutes the sky went from “nice” to “utterly magical”. Last night was our last night at the Aurora Borealis Lodge, and since they had a lot of guests we decided to hike a few hundred yards up the hill from the main lodge to enjoy the skies with a bit less noise. It wasn’t terribly cold (perhaps 20°F), so Audrey and I soaked in the solitude for a while before wandering back down to the lodge to warm up. No sooner had we taken our hats and gloves off when the sky started to light up, and we rushed back outside for what the lodge owner later called the best display thus far in 2018. Auroras lit up the northern half of the sky, then danced overhead and filled the southern half of the sky with light. There were multiple colors, pulsing and dancing lights, streams of fire that burned across the horizon, and enough magic to make you believe in the ancient stories of the Aurora being heavenly spirits or flames in space. The show finally started to fade just after 2AM, and we reluctantly returned to our cabin exhausted but elated. Sadly the weather forecast for the next several days is calling for mostly cloudy skies, but we embarked on this trip hoping for at least one great night, and we definitely got that, so no matter what happens from this point onward the trip has been a successful one. The moment when things started going from good to insane. Eight second exposure using an 18mm lens. The Aurora, directly overhead. Six second exposure using an 18mm lens. At the time this photo was taken I’d been outside in the cold for nearly four hours straight and wasn’t close to wanting to go back indoors. Fifteen second exposure using a 14mm lens. The cold is not as bad as expected, even at temperatures that have dipped down as cold as -20°F. That is, it isn’t as bad as expected until the wind blows, at which point a freezing blowtorch of pain reminds you that you’re in Interior Alaska in January. The Northern Lights vary a LOT. Sometimes they are so faint that you can only see them after taking a long camera exposure, other times they seem bright enough to read by. Sometimes they look like a glowing cloud spread across the sky, other times they look like dancing ribbons. Sometimes they appear white, sometimes green, sometimes red, sometimes purple, and sometimes a combination of all of these colors. For anyone chasing the lights, the SpaceWeather.com Aurora “oval” forecast and the nightly weather forecast are your two best friends; clear skies and a portion of the oval in your vicinity will make for a happy evening. Three of our four nights at the Aurora Borealis Lodge have so far had great displays, generally starting around 10PM and ending around 2AM when we are finally so tired that we head off to bed; the only night we didn’t see the lights was due to cloudy skies. Finally, in the “things you wouldn’t think about in the Lower-48” department, a tanker truck came by to deliver water to our cabin today – the lodge is too remote for there to be city water available, and a well would freeze, so regular water deliveries are what allow us to take an occasional shower. A moment of extra happiness last night. Eight second exposure using an 18mm lens. While the Aurora sometimes looks like the sunset, this picture was taken facing north, eight hours after the sun had disappeared in the south. Six second exposure using an 18mm lens. Finding a sharp focus in the dark has been quite the challenge, so I’m insanely proud of the fact that these tress stand out as clearly as they do. Six second exposure using an 18mm lens. We’ve started on phase two of this trip, moving from our temporary home in downtown Fairbanks to the Aurora Borealis Lodge on a ridge twenty miles outside of the city. Without any city lights the aurora is visible across the northern sky, and we’ve had two straight clear nights where the displays were epic. Tonight there are clouds covering the sky, but the forecast calls for some clearing around 1AM, so it may be a late-night wake-up to catch the evening show. The logistics of photographing this natural wonder are still a challenge to me – between keeping the camera steady for long periods, focusing in the pitch black, and not freezing to death it has been interesting. At one point last night I was heading back outside after coming in to warm up and noticed that everything looked blurry in my viewfinder – turned out there was a layer of ice covering my lens, and I had to wait a bit to let the camera thaw; that was a first in the three decades since my dad gave me my first 35mm. Last night’s northern lights display, taken just before midnight. My Boogers Froze Today. Twice. Since my job lets me work from anywhere with an internet connection, spending two weeks in Fairbanks in the dead of winter seemed like it would be a great idea. Audrey and I will be huddled together for warmth in the coming days, hoping that the northern lights make an appearance at some point. After arriving late last night we spent today’s sparse daylight hours bundled in every piece of clothing that we own, roaming past the frozen Chena River through Griffin Park in downtown Fairbanks, before we were finally forced into the (very impressive) Visitor Information Center to escape the -8°F temperatures. Tomorrow we head further north to spend the rest of the week in a tiny cabin outside of the city lights in the hopes that the Auroras might peek out at us once or twice. Wish us luck. 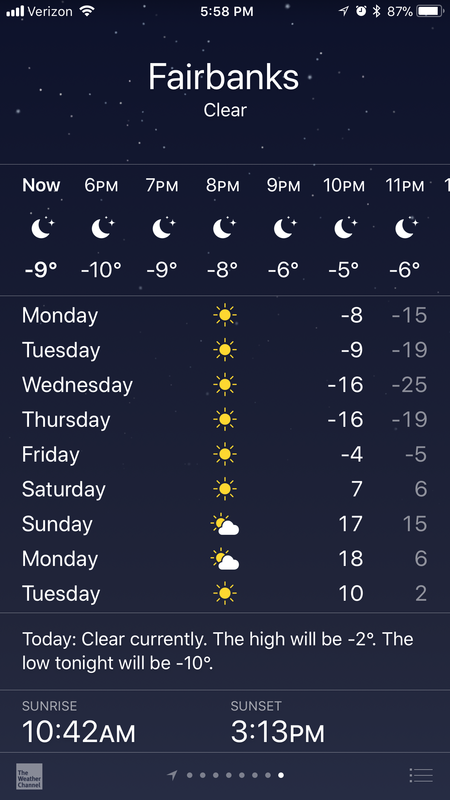 The weather forecast for the week gives us nearly four hours a day of the sun’s warmth, so we should have decent odds of not freezing to death. This tree in Griffin Park got dominated by the Fairbanks winter. Even the statues in Fairbanks are freezing. Author ryanLeave a comment on My Boogers Froze Today. Twice.